A rain garden in Tucson, Arizona that captures stormwater runoff to support native plant landscaping. Photo Credit: US EPA. Stormwater management involves addressing complex and challenging human health and ecosystem protection goals. There is growing interest by communities in changing the way stormwater is managed – away from the historic approach of conveying runoff to downstream points as rapidly as possible and toward other approaches such as low impact development (LID) design that retains and uses runoff as close as possible to its source. Traditional stormwater site development conveys surface runoff quickly to a central point, such as a constructed channel or detention basin. Because there are no natural features to slow flow, this results in an increase in runoff volume and peak discharge, while LID reduces the peak discharge rate and runoff volume. 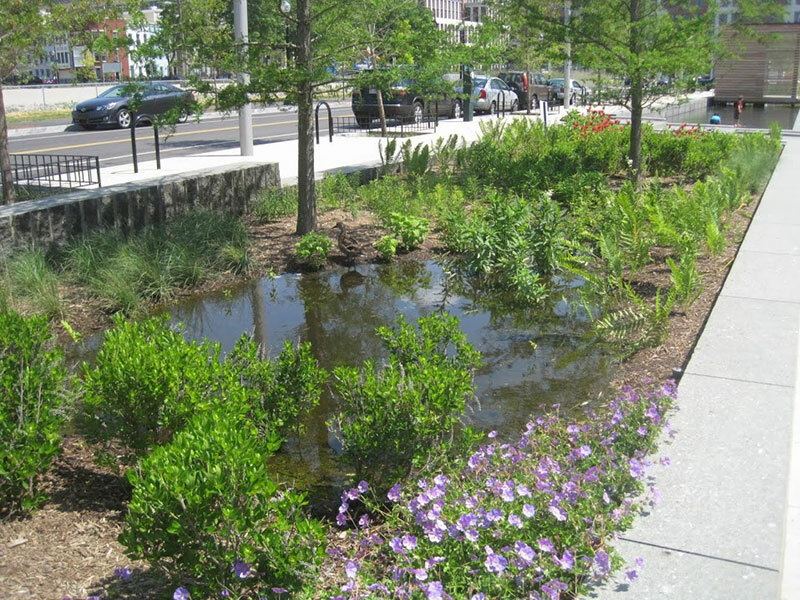 Among the multiple benefits to managing stormwater using LID compared to conventional management approaches are that it saves money for developers and local governments, enhances the local environment, improves community livability by supporting trees that make streets more walkable, and provides recreational opportunities. “Green Streets” programs, which are generally components of transportation planning, are an example of managing stormwater to enhance community livability. Stormwater programs are designed to reduce non-point source pollution discharge to rivers and washes to meet federal and state water quality regulations, including Combined Sewer Overflows (CSOs), National Pollutant Discharge Elimination System (NPDES), Stormwater Phase II permits, Total Maximum Daily Load (TMDL) permits, and Nonpoint Source Program requirements. This is typically done by directing runoff to on-site basins. Conventional management typically disrupts the local hydrologic regime, requires construction of expensive stormwater infrastructure, and may not adequately address water quality issues. LID can also be used to address many water quality regulations, using a variety of features including bioretention basins where waters carrying pollutants and sediments are allowed to infiltrate, and water retained on site can be used for landscape irrigation.